Why is it when the tomatoes in the garden start to produce, I just can’t seem to wait for them to ripen? Hooray for Fried Green Tomatoes! This is an easy recipe that I’ve used for years and good for any quick weeknight meal. We like these in place of meat, with a little rice and some black beans on the side. To add a little spice, this Arugula Radish Topping is so easy, and uses some of the soon-to-be-gone produce I find in the garden this time of year. It’s so easy to make, and is good on the rice too! Enjoy all the blessings found in the garden and don’t wait for red tomatoes! Slice the tomatoes about 1/4″ thick. Dip them in the beaten egg. Press each slice into the bread crumbs, coating both sides. Dip them again in the egg, and coat them again with breadcrumbs. Fry in medium-high hot vegetable oil until crispy and golden. Drain on a paper towel covered tray before serving. Makes about 12 slices. Bunch up all of the arugula into a ball and chop up. Dice the radishes. Mix both together with the mayonnaise to make a thick topping. 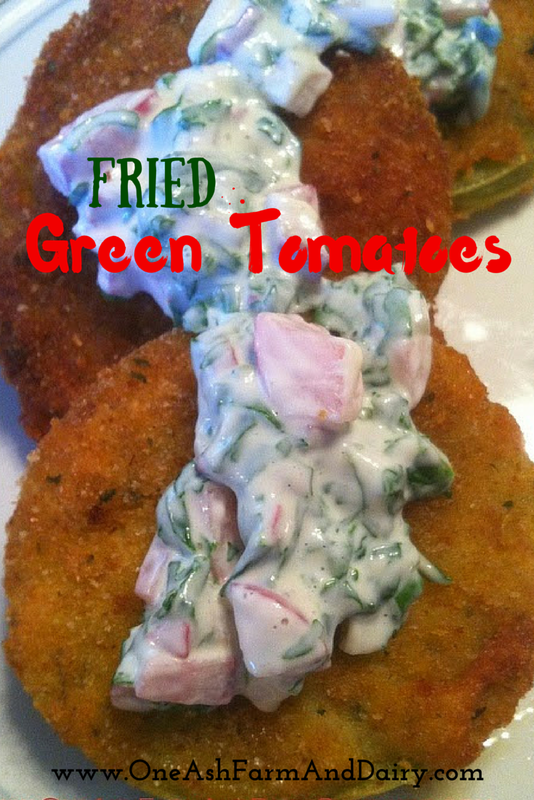 Serve over warm fried green tomatoes. Also good on the rice!